This blog has talked before about the CFS mission to help ensure that working-class Americans have access to financial tools and advice – including agents who represent a vital link to products like IRAs and life insurance. In pursuit of that goal, CFS has done a fair amount of work on how financial professionals are licensed and get into the business. CFS's work on licensing has uncovered instances where state licensing requirements, particularly licensing exams, may be serving as an unfair and unnecessary barrier to entry into the profession - - to the detriment of consumers. While licensing is important and meant to protect consumers, consumers are not protected if the pool of professionals on which they can rely is artificially limited. There is new evidence that New York consumers may be paying the price for something as simple as the Department of Financial Services changing the vendor that administers its licensing test. 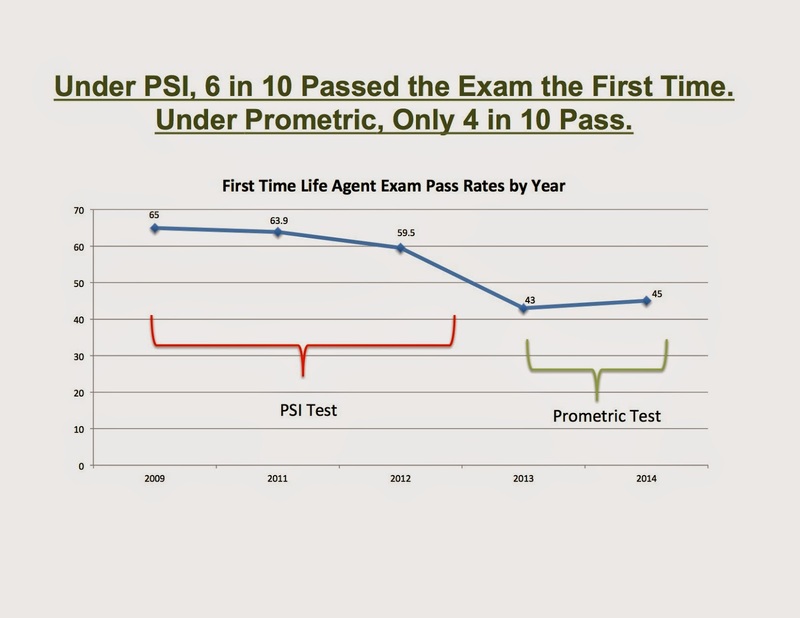 As illustrated in the chart below, the pass rate on the New York Life Agent exam has dropped precipitously under the new exam vendor, Prometric. Under the old vendor, PSI, first time pass rates were above 60% for years. Since Prometric began giving the test in late 2013, the pass rate has been in the low 40s. 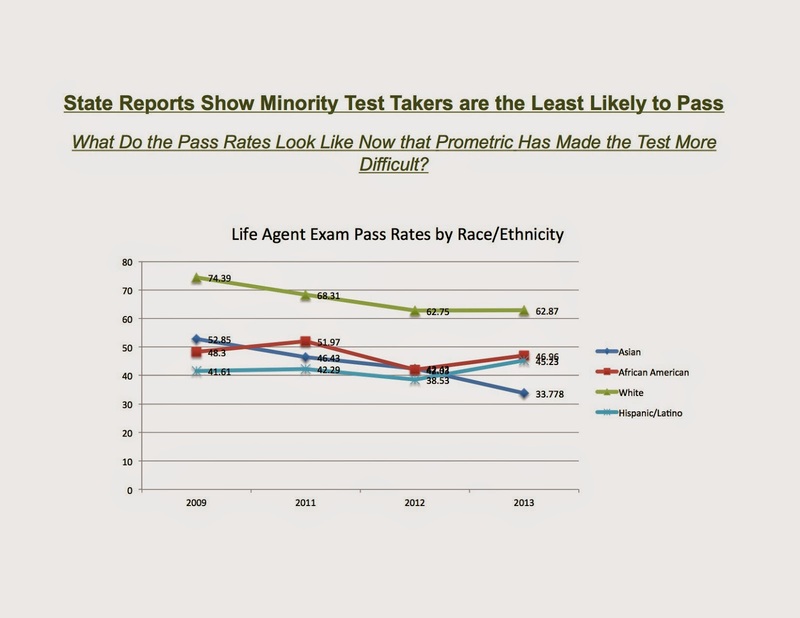 Judging from the pass rates, the New York Life Agent exam has become more difficult under Prometric. Why that would be the case is not clear. The laws did not change. The job did not change. All that changed was "who" gives the test. The adjustment in difficultly raises a basic issue of fairness. Why should a New York agent have a more difficult time entering the profession in September 2013 than one in September 2012? Absent a public policy reason, they shouldn't. From a consumer prospective, there is significant cause for alarm. LIMRA’s 2010 survey of the life market found that “almost eight in 10 U.S. households currently do not have a personal life insurance agent or broker to turn to and most of them say they never did.” Among Hispanic and working class households, the lack of reported contact with an agent was even higher. Coming back to New York, the DFS publishes a yearly report (results since 2009 below) showing that those candidates for a license MOST likely to work in underserved communities are the LEAST likely to get a license. As the chart shows, these pass rates by demographic were alarming under the old vendor. One can only imagine what they look like under the new vendor, as the overall pass rate has dropped. With life insurance usage so low, and Americans searching for individuals to talk to, will public policy makers listen? As long as candidates for a license in states like New York encounter arbitrary barriers to entry like a new test vendor, consumers will continue to suffer the consequences.